All charting platforms come with a lot of indicators, much less Paint Bar studies. And most of them function as "Show Me", such as "Day of Week", "Expiration", "First Bar of Week", etc. In my humble opinion, Paint Bar Study is way under appreciated. They say the best indicator is price action. If you have a good Paint Bar study, you add more information on the candle sticks, then all you need is one or two good indicators in the sub-graphs. It will help you make the right trading decision a lot faster, as you will probably be focusing on the price most of the time anyway, and it will save you a lot of screen "real estate" space, without having to clutter your chart with many more lagging indicators. 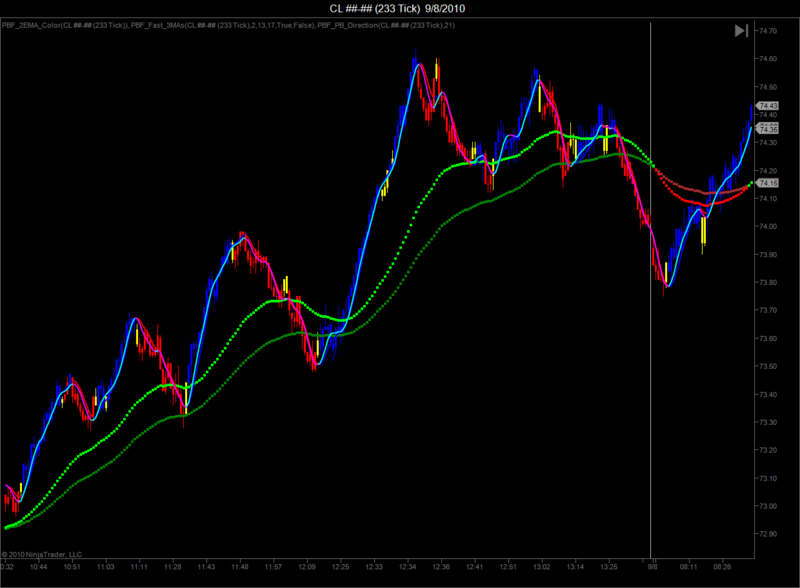 Look at this CL chart below. Regardless the volatile market condition, our paint bar did an excellent job. Buy blue and sell red. Seriously, how much easier can it be? 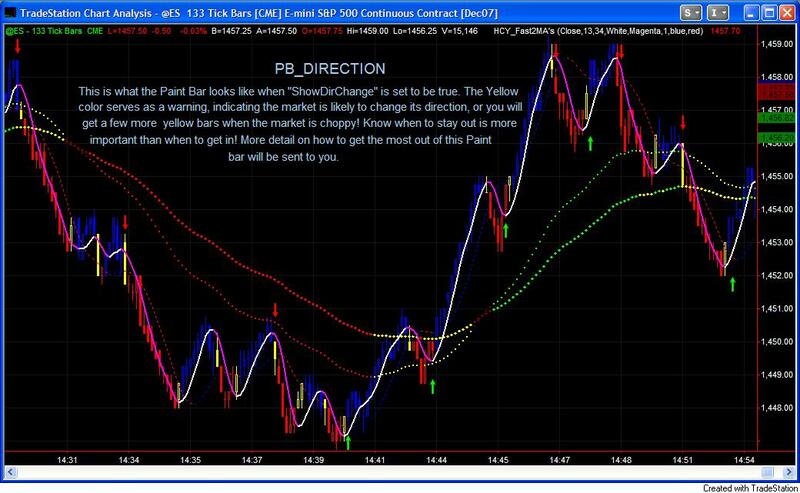 More importantly, the PB_Direction has this unique yellow bar, which appears in REAL TIME (and never repaint once a bar is closed) and often right at the market's turning point. It is simply incredible. Below is a picture without any Paint Bar Study. The "Before" picture. Compare it with the "After" ones, and see how much the Paint Bar Studies can help! The first Paint Bar study I'd like to introduce to you is the PB_Direction, the perfect partner of The Squeeze. It is a rather complicated Paint Bar! Complicated in terms of coding, not using! A lot has been built in. From the following pictures, you can see it catches the turns pretty well. Buy blue, sell red, sounds simple, right? Trading for a while, more and more I feel the best indicator is the price. That's free for you if you have a charting service! The second best indicator, in my opinion, is adding information on the best indicator: paint bar! You can almost trade with just a good paint bar study and a couple of fast, responsive moving averages as shown in the chart. Almost! Does the chart make sense to you? It also shows the strength of the trend when the "ShowTrend" is set to be true. The resolution of the picture here is not good. 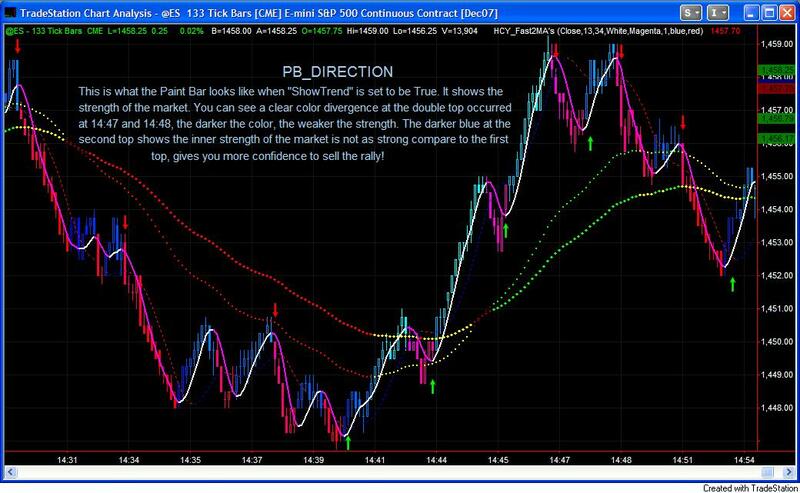 But you can still see the obvious difference in colors at the double top there described on the chart. The "triple tops" at 14:36, 14:38 and 14:43, you can clearly see the last top has a much lighter color than the previous 2, telling you the market is strengthening, and likely to turn around here. The EMAs turned yellow, indicating the possible reversal of the trend. You may enter a long position when the FastMA turned around and the first candle that turned blue! As if it is not good enough, let's spice it up even more! When the "ShowDirChange"(Show Direction Change), is set to be true, you get some bars painted in yellow. The yellow bars are the ideal places to take positions. It occurs near the turning points, giving you a visual assistance to enter a trade or get out of a trade. 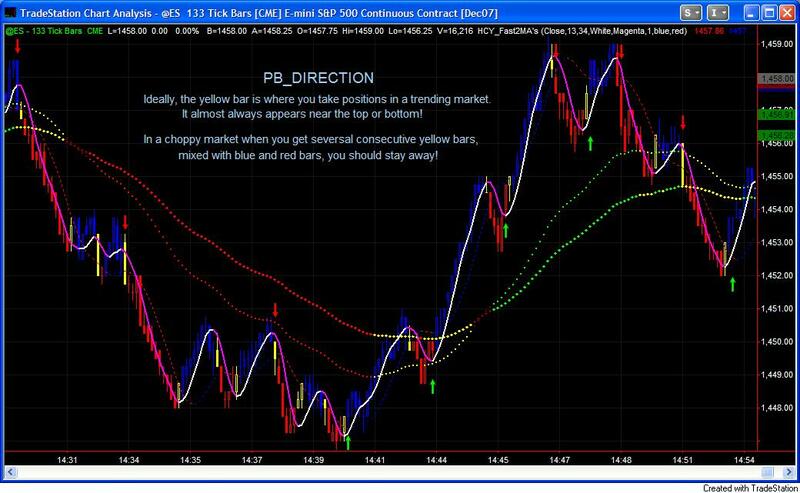 Also, when the market is choppy and moves sideways, you will get some consecutive yellow bars mixed with blue and red bars. This is designed to confuse you! When you are confused, you don't enter a trade, do you? I hope not! 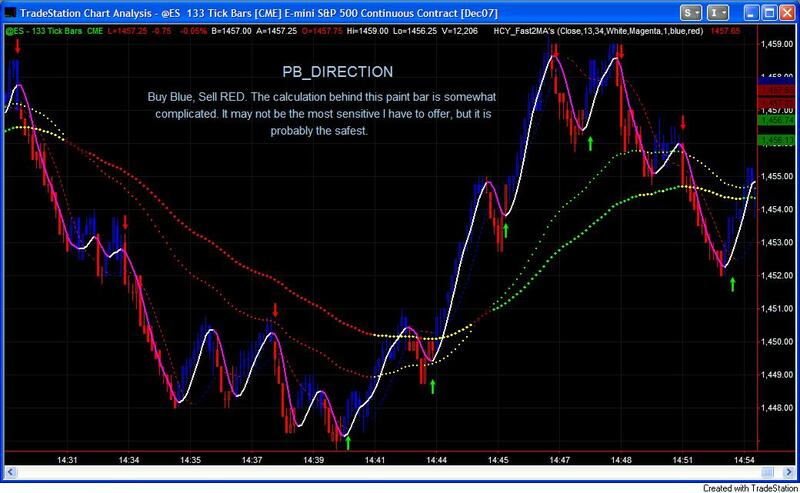 Below is a screen shot of PB_Direction on NinjaTrader Platform. Please note, the "Show Trend" mode is NOT available for NinjaTrade version as the C# coding language does not support the necessary function to accomplish the task. 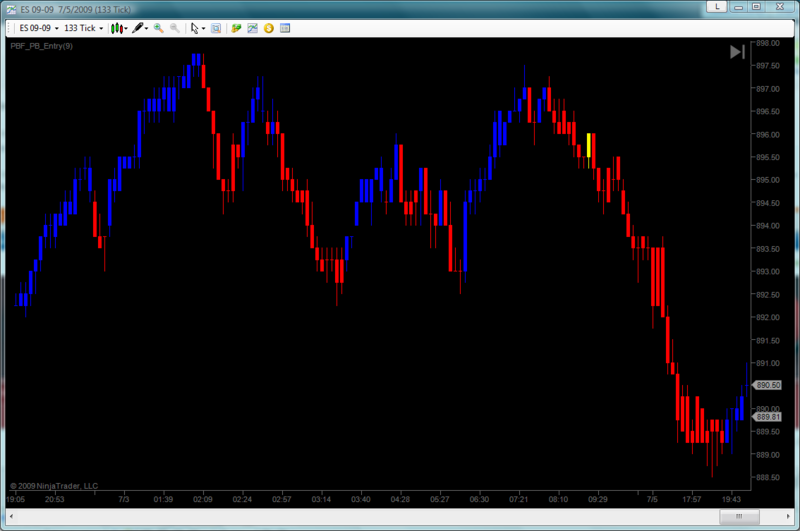 The three-color version is the only version available for NinjaTrader. This Paint Bar study employs ONLY the price data. Like I said, price is the best indicator. As you can see, it is rather responsive and almost always changes color at the EXACT turn. You may change the colors if you want! 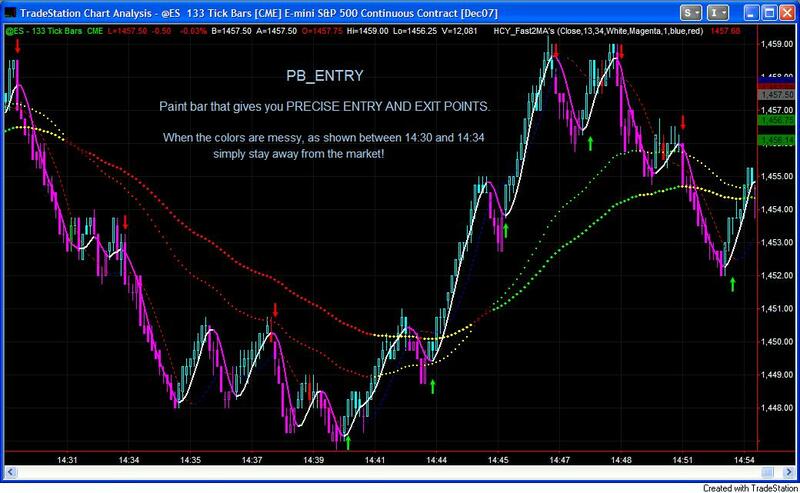 Below is a screen shot of PB_Entry on NinjaTrader Platform. 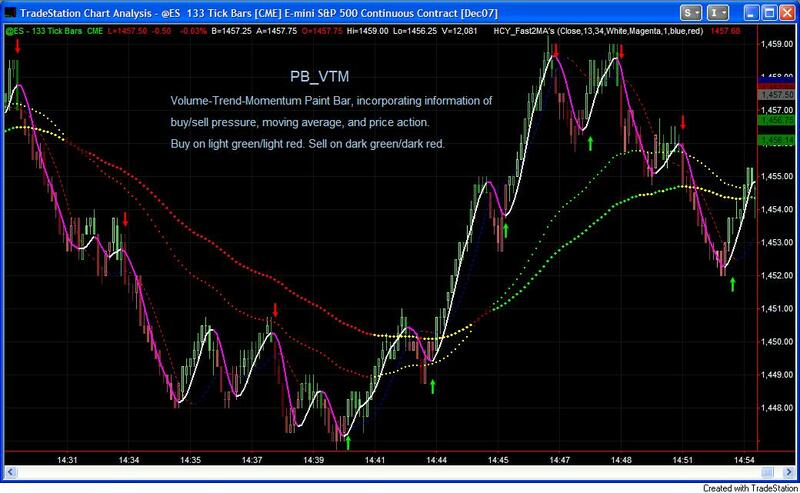 Pleast note: The PB_VTM paint bar study is NOT available for NinjaTrader version as the coding language and data do not support the necessary function to accomplish the task. 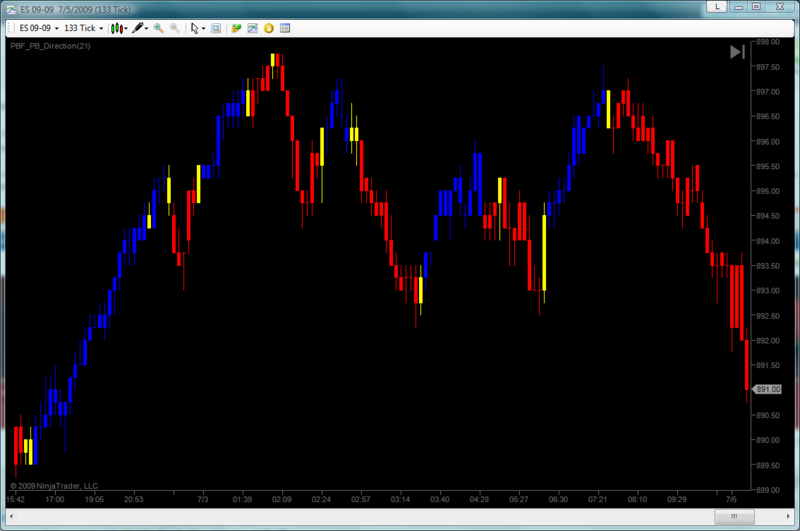 Hence NinjaTrader customers will NOT receive a free Paint Bar study at this moment. How valuable if I tell you that you can get the buy/sell pressure and the trend information just by looking at the candlesticks? 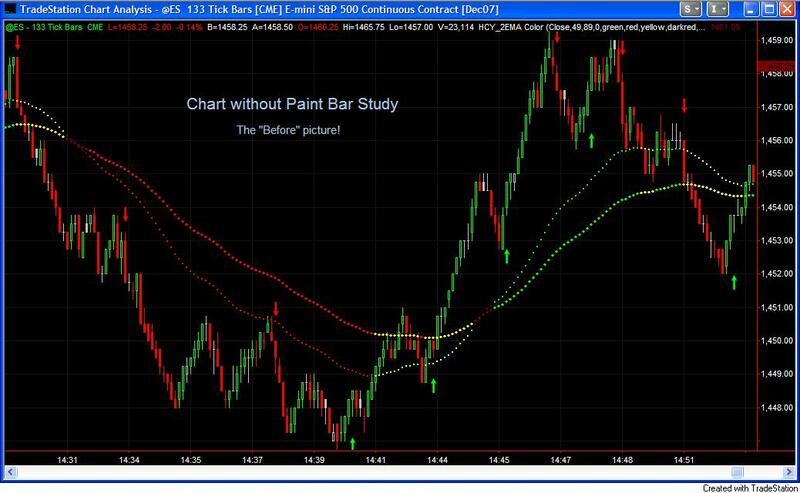 This Paint Bar study paints the bar using the buy/sell ratio, moving average, price action, and momentum. Again, the color is off here! Sometimes when I trade intraday staring at the chart with my first version of this Paint Bar Study, I forgot to enter a trade because it looks so beautiful! Now that might be a distraction! The first version employed more shades of colors, which provides more detailed information but can be confusing at times if I can't digest all the information it provides in a fairly short amount of time. This version, basically, employs two series of colors, green and red. Lighter green means upward move with a lot more buying than selling, darker green often appears at the top of a wave or the beginning of a pullback when sellers outnumber buyers, indicating possible direction change to the down side. Lighter red means downward move but there is more buying than selling, implies possible direction change to the upside, while darker red means heavy selling, often appears in the beginning of a downward movement. If you are a visual person, just observe this paint bar! After a while, I am sure you will, just like me, find certain "color patterns" that occurs over and over again at each turn! You are really just looking and waiting for a long, filled dark green or dark red bar to sell, and a hollow, light red or green bar to buy.